These center post bar rail brackets offer installation ease, as well as the flexibility to place on a wall, floor, or bar facing without sacrificing style. Whether you're looking to install bar foot rails, bar armrests, or handrails, this low clearance center post bracket is a simple, sturdy solution. 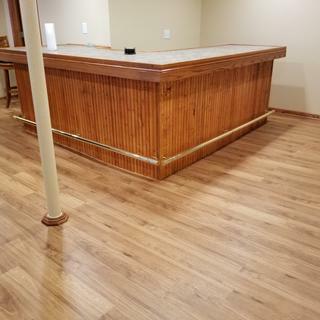 With just one foot that can mount to a floor, wall, or bar facing, center posts make it easy to plan your project and install your bar rail tubing. We also offer brass end caps that match the finish and low-profile design of these bar foot rests. Upon installation, this low clearance bar foot rail will sit approximately 4.5" from the floor to the center of the tubing. 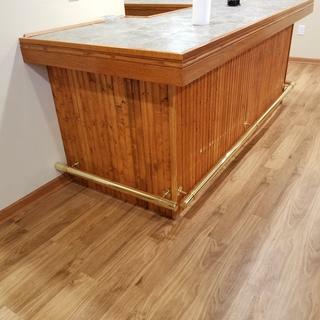 It is perfect for situations where it's better to place your bar rail in a more flush location to the floor or wall it is attached to. Unlike bar mount, floor mount, 90-degree, or combination brackets, there is only one contact point with these center post bar brackets. For proper support, it is recommended to place one of these rounded center post bar foot rail brackets at each end of the tubing, plus one for every 4-foot increment. Be sure to measure precisely where to place the screws ahead of time. I was very impressed with the product. The quality and strength was excellent . The polished brass is beautifull to the eye. This solution is significantly more effective for use by DIY residential purpose than other braces. The vertical support brackets are perfect! they look nice and they fit with the idea I have to mount an oak grab bar at our front door step. I have a small standing bar and do not want the rail to project too far from the bar. Good Price and great easy website!